There is NO Good Cuisine if it doesn’t start with Hard Work, Care, Passion, Talent and some Fun…. That’s our Philosophy at Z Cuisine….our farmers too ! Let me present to you Z Cuisine Team ….. Patrick/Kate/Brandon/Jenny/Carlos. 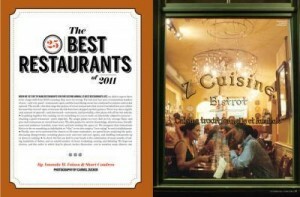 They are famous to their friends and family and all of our talented staff working at Z Cuisine. If you would like to sign up for our newsletter please send us your email. Merci!